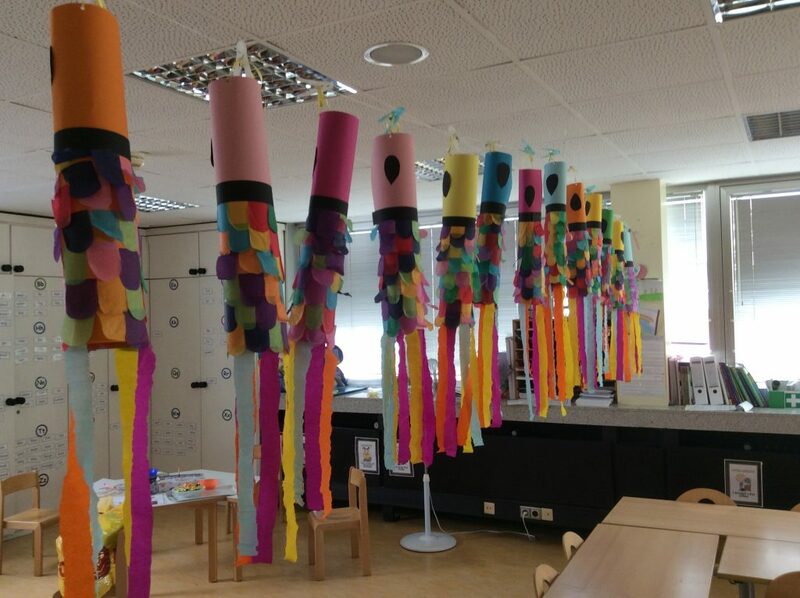 Using internationalism as a driving force, a Primary Years Programme (PYP) school community in Germany developed a mini-unit focused on highlighting individual and collective cultural identity and to celebrate yearlong learning experiences. As an IB World School our community regards international-mindedness as a key component of development and understanding. Reflecting on our past and looking to the future, our school community set out to strengthen how we integrate the broad concept of “internationalism”. Beginning with our definition of internationalism, “Internationalism at Metropolitan School Frankfurt celebrates diversity, fosters open-minded inquiry and promotes an intercultural understanding of the world,” team efforts began with an analysis of existing learning activities that related to internationalism. to create authentic opportunities for reflection and celebration of the learning that has taken place throughout the year. In the initial development phase, classroom and specialist teachers took part in a series of collaborative planning sessions to devise the unit’s essential elements and to brainstorm guiding questions that could be translated into learning experiences. Team essential agreements were the following. 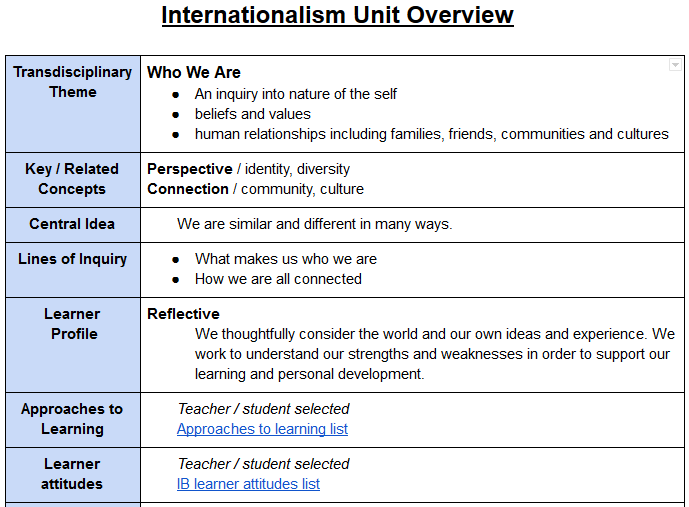 Internationalism unit overview with team developed essential elements. With essential elements and planning guidelines in place, teams used break-off sessions to select and expand upon the guiding questions that were relevant to their grade and/or subjects. Subsequent sessions focused on collaboration across grade levels and with subject specialists. These sessions aimed to create opportunities for transdisciplinary integration and team-teaching. Due to the mini-unit being staged in the final week of school and concurrent to the last unit of inquiry, teams enjoyed the flexibility to shift focus between the main unit and the internationalism unit. Furthermore, teams chose to maintain assessment focus on the primary unit of inquiry and use the key concepts perspective and connection to promote reflection and self-evaluation. Teachers and students alike noted that this arrangement encouraged experimentation and was a major contributor to the success of this unit. Grade five teams explore identity and the concept of internationalism. In the first year of implementation, the internationalism unit was met with great enthusiasm by students, families and teachers alike. Learning engagements were widespread, diverse and celebrated aspects of many of the 49 nationalities represented in our community. Reflecting on the highly successful first year, it was evident that the unit concepts were accessible, engaging and relevant but also that there were areas that could be further expanded. 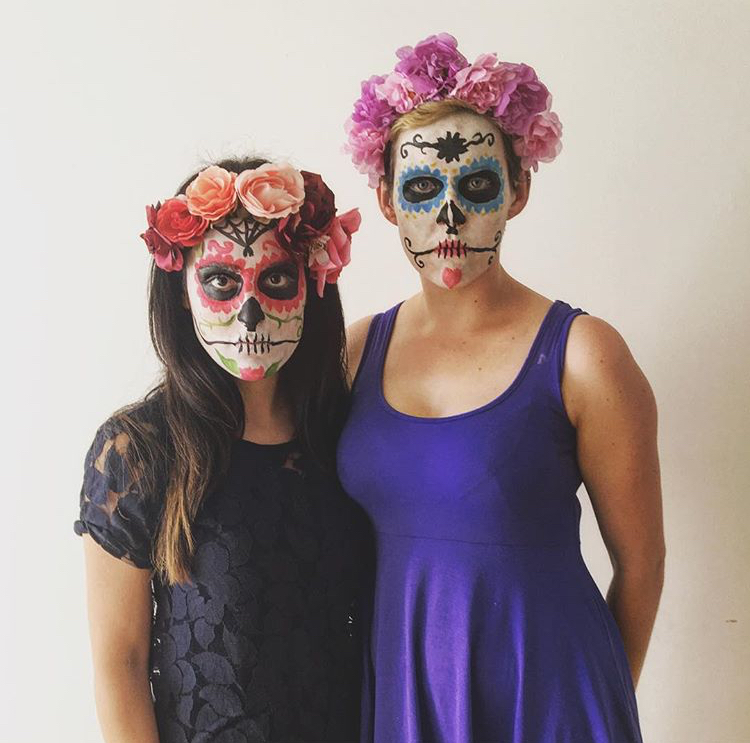 Teachers enjoyed celebrating “Dia De Los Muertos” with traditional face paint. Teams acted to refine their practices by exploring the research base and creating a bank of useful resources for all teams to share (teams found the IB research on developing and assessing international-mindedness (Hacking et al., 2017) particularly useful). As the study suggests, teachers shifted the focus of reflections onto student understandings. Teams also agreed to concentrate learning engagements on “reaching in” to understand how we as individuals relate to others and “reaching out” to understand how we interact and connect with others. The enhanced unit focus was further supported by linking the related concepts of identity/diversity to perspective and community/culture to connection. Subject specialists again joined planning sessions to strengthen transdisciplinary integration while feedback from parents and students was gathered and used to inform teacher planning. Library specialists supported by compiling a literature list focused on intercultural understandings and global perspectives. Furthermore, an emphasis on developing connections across the school community led to collaboration with staff from all divisions including English as an additional language, physical education, visual and performing arts as well as the German language teaching staff. 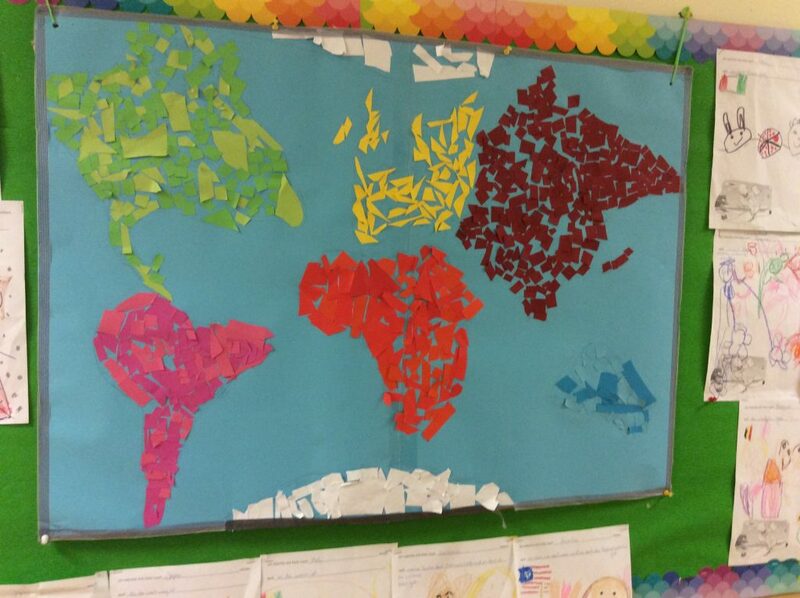 Early Years and Primary Teams collaborative creations (1). 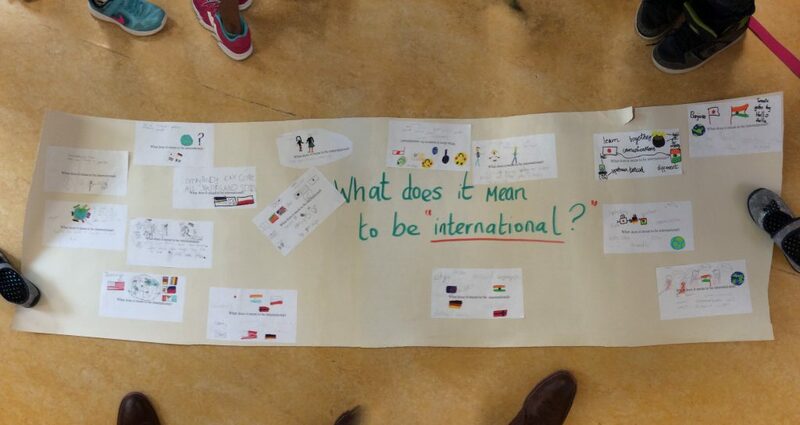 Now in its third year, the end of year focus on internationalism through this mini unit has proven to be a highlight in our programme of inquiry with teams continually finding more and more creative and engaging ways to celebrate internationalism. With updates coming around PYP enhancements, discussion has already begun about how we can further integrate internationalism throughout the programme of inquiry. Hacking, E, Blackmore, C, Bullock, K, Bunnell, T, Donnelly, M and Martin, S. 2017. The international-mindedness journey: School practices for developing and assessing international-mindedness across the IB continuum. Bethesda, MD, USA. International Baccalaureate Organization. Cody Norenberg is the Primary Assistant Principal and PYP Coordinator at Metropolitan School Frankfurt in Germany. His passions include international education and initiating high quality, innovative learning and teaching structures. 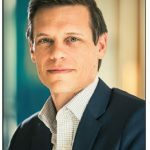 An IB educator since 2008, he finds interest in creative approaches that support students, families and staff in exploring and connecting with the IB approach to development.